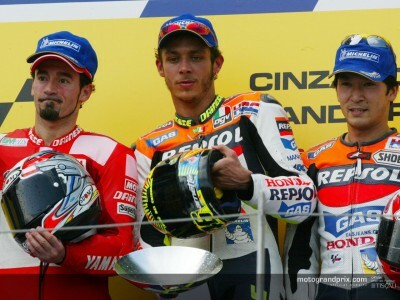 Valentino Rossi (1st) : ´This has been the most difficult race of the year, winning proved to be quite tricky. Get past Jacque and Barros has been pretty difficult, and later, I made a mistake. They took the lead again, but I was gifted victory when they crashed. Then I pushed, because Biaggi was very close and there was only three laps to go´. Max Biaggi (2nd) : ´Victory has never been so close. It was a tough race. I´ve been struggling with the bike when the fuel tank was full. After Barros and Jacque´ crash, I sat for second. I´m satisfied as the M1 finished between the two Hondas ; I have to thank my team for their work´. Tohru Ukawa (3rd) : ´I´m happy with this podium, after crashing in Donington ; I couldn´t focus because of the pain and I couldn´t avoid to get passed by Barros, Jacque, Rossi and Biaggi. I´m pleased with this result and I would like to thank the Mobile Clinique´ doctors´.